This new production of Tony Kushner’s 2003 musical, set in Civil Rights-era Louisiana, coincides with the National Theatre’s revival of Angels in America. But Caroline, Or Change generates its own distinctive energy – from the moment the Washing Machine shimmies on in a dress made of bubbles. Complex yet big-hearted, joyfully exuberant but sharply political, it’s owned by Michael Longhurst’s brilliant multi-generational, multi-cultural cast, and elevated by a genius dash of oddball camp from designer Fly Davis. As Jeanine Tesori’s fresh and restless, Motown and Klezmer-inspired score makes clear, change is everywhere in 1963 – even in Lake Charles. 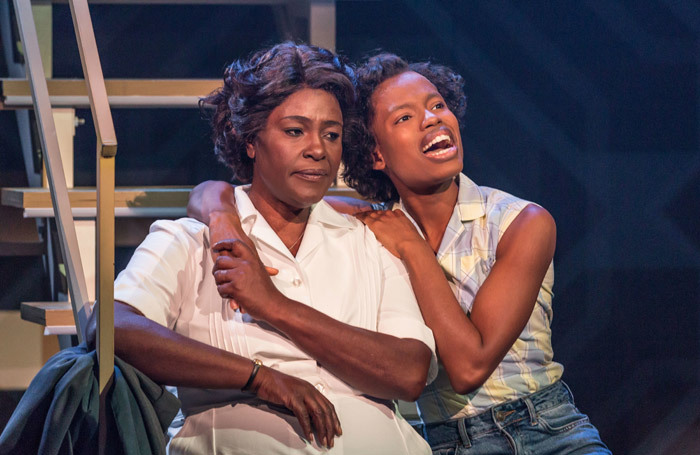 But it hasn’t quite infiltrated the basement of a Jewish household, where Sharon D Clarke’s black housemaid Caroline washes the white family’s clothes to feed her hungry children. The show’s devastatingly understated moral dilemma begins with the rattle of a child’s pocket change in her bleach cup. Clarke’s Act II solo, begging God to “murder my dreams”, is extraordinary – a psychological wrestle of key changes and genre shifts. Elsewhere a Supremes-esque trio and a beaming mama Moon refuse to let her trapped spirit lie. Ako Mitchell’s rumbling spirituals add another note still. Who’d’ve thought a tumble drier could have such stage presence. Compelling backstories produce a rich criss-cross of interactions between the Jewish boy and his stepmother, or her communist father and Caroline’s teenage daughter, lithe and straining with hope. And hats off to the Minerva’s revolve for its capture of the parallels, and uncrossable divides, between black American and Jewish history.